My fear is that as we rightly celebrate, and in some quarters rediscover, all that Christ has saved us from, we are giving little thought and making little effort concerning all that Christ has saved us to. Shouldn’t those most passionate about the gospel and God’s glory also be those most dedicated to the pursuit of godliness? I worry that there is an enthusiasm gap and no one seems to mind. We would do well to ask the reason for this gap, and here DeYoung proposes several answers: In the past Christians equated holiness with abstaining from a few taboo practices such as drinking and dancing; our churches have many unregenerate persons in them who are necessarily uninterested in holiness; we emphasize a culture of cool that pushes the boundaries with language, entertainment, alcohol, fashion, and whatever else is deemed cool; labeling something as unholy or ungodly feels judgmental; we fear legalism and are frightened by words like diligence, effort and duty; we face the reality that pursuing holiness is hard work; and finally, many Christians have tried and just plain given up. 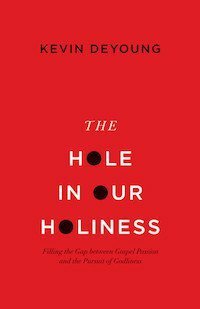 Through nine short chapters, DeYoung goes on to show what the Bible says about holiness, to answer some of the contemporary objections to it, and to offer challenges in a few of the areas where we may be accepting and even celebrating unholiness. The chapter titled “Saints and Sexual Immorality” is especially to the point as he challenges us to see that maybe, just maybe, we’ve allowed the world to squeeze us into its mold in the area of sexuality. This is true not only in our sexual ethics and behavior, but also in the things that entertain us and the things we laugh and joke about. One of the book’s strengths is in its constant encouragement that we actually can be holy. What God calls us to he also empowers us to attain. Yet too many of us have tried holiness and have found it too difficult, too insurmountable a calling. DeYoung says rightly that “There are a hundred good things you may be called to pursue as a Christian. All I’m saying is that, according to the Bible, holiness, for every single Christian, should be right at the top of that list.” I couldn’t agree more. While Ryle, Sproul and Bridges have written books that are almost timeless, DeYoung’s humor and references to culture keep it bound in the here and now. But this is exactly what makes it such a great complement to those other works. It does not replace them, but stands beside them. If holiness really is meant to be at the top of the Christian’s list of priorities, then we do well to equip ourselves by regularly reading about the subject. The Hole in Our Holiness will challenge, equip and encourage you to put sin to death and to be relentless in your pursuit of holiness. I don’t think I can pay the book a higher compliment than that.